The economic advantages of commercially recycling your office waste are clear. Commercial recycling programs can reduce waste volumes and disposal costs especially in the work place they provide revenue from the sale of recyclable material and reduce operating costs. Recycling provides raw material to make new products and creates jobs in collection, processing and manufacturing. Over time, recycling saves energy and natural resources and can enhance a company’s public image. Drink cans aluminium & Steel. Complete Computer systems including printers and other obsolete machines can also be collected and recycled under a WEE scheme – although not undertaken by GHS Recycling, we work alongside a company that can offer you this service, which we highly recommend. Waste Transfer Notes are issued to cover Duty of Care Regulations, and if required, a Recycling Audit, detailing weights of material collected, can be supplied. 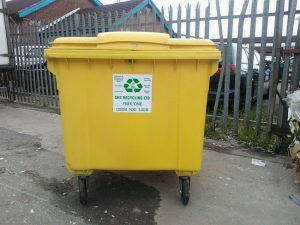 We supply waste recycling bins for use in the office and plastic bags for the bins. There is a small quarterly service charge to cover provision of plastic bags and administration. Office recycling is the easiest scheme to involve everyone in. Do not start everything at once. It is best to have a gradual approach, starting small and working up to full recycling. Start with what you think will work best. The most obvious place is to start with paper. 70% of office waste is made up of paper. Most of which is high-grade white paper, the most sought after type for recycling. Our office waste management and recycling services are practical, cost effective and tailored to meet your needs. Give us a call on 02392 670 399 or Email: info@ghsrecycling.co.uk and our friendly team will be more than happy to help.